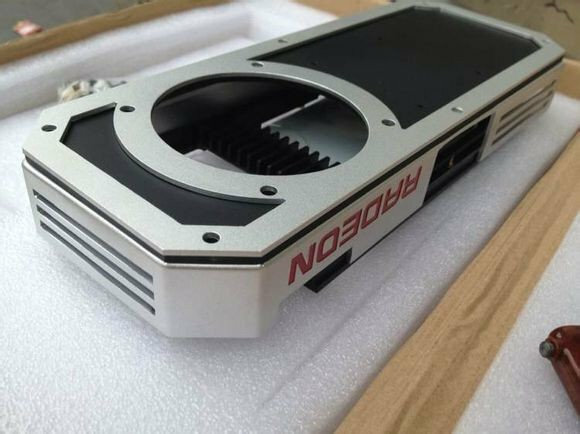 Recently a photo of a new AMD Radeon reference cooler surfaced which is believed to be the reference cooler of the company’s upcoming Radeon R9 300 series graphics card. Most probably this cooler would be for their flagship graphics card, the Radeon R9 390X. Guess who’s making AMD’s cooler? None other than Asetek. A few weeks ago Asetek announced that they secured a design win with an undisclosed OEM customer for a graphics liquid cooling product. Many of you are already familiar with Asetek, the maker of most All-In-One liquid CPU cooler out there. They were also the one who designed the Radeon R9 295X2 cooler. So this could mean that AMD’s flagship graphics card will be water cooled out of the box. From the picture above, you can see that it could probably be a hybrid custom cooler. Probably an Air+Water or just plain AIO closed loop cooler. You can see where the power connectors will be located as well as the loop will be. You can also see the heatsink for the VRM. But one question came into my mind, why is AMD using a hybrid / liquid cooler for their next flagship? Do they want gamers to enjoy a cooler system at full load, or does it mean that the next flagship will be hot or will product more heat than its predecessors? As of today, there are no words yet as to when will AMD unleash their next flagship AMD Radeon R9 390X or their R9 300 series graphics card. Probably they are waiting for NVIDIA to unleash everything and counter the green team with everything they got. It’s also unknown whether the next generation graphics card will be based on Fiji or another GPU family.